Whitehall got rather crowded at times the other Sunday afternoon with four different groups of protesters. 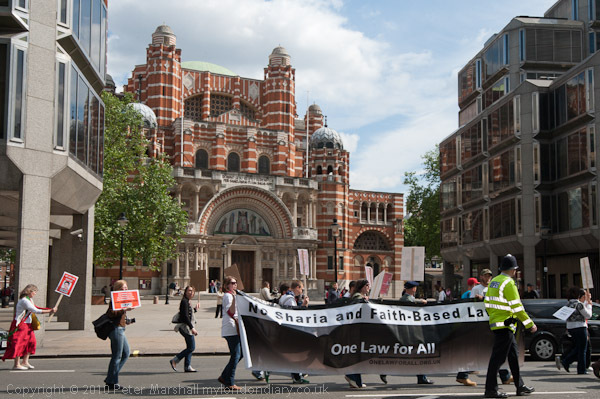 The instigation of it all was a protest by ‘One Law For All‘, a group combining various people opposed to the imposition of Sharia Law in the UK. 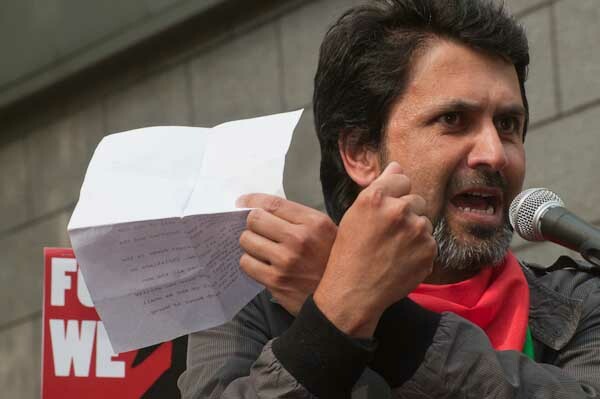 They include members of various secular and human rights organisations and a large group of Iranian human rights activists, trade unionists and socialists of various persuasions. The denial of equality for women in Islamic societies is one of their main complaints and they call for laws to be secular and completely separate from religion, both in Iran and in this country. One Law For All also believe in freedom of religion, but not in the right of people to impose their particular religious beliefs – or laws that arise from them – on other people. Laws should arise from principles such as equality and human rights and not from religious books and their interpretations. In England we still have some remnants of faith-based laws – such as those against blasphemy, but in general our laws have moved away from this over the years. It clearly isn’t an Islamophobic movement, but arouses vocal opposition from a small fringe group of fundamentalist Muslims who campaign for the UK to become an Islamic country. 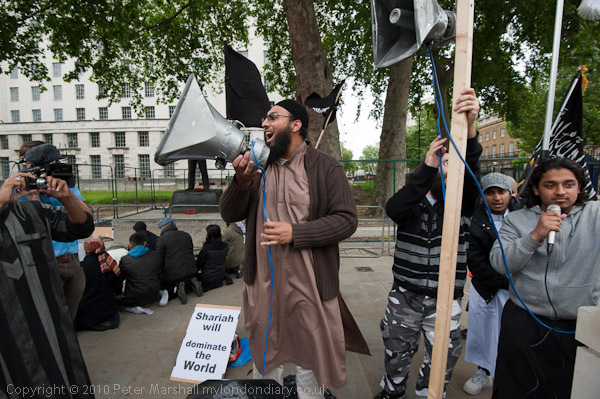 This group, formerly Islam4UK but now calling itself Muslims Against the Crusades, is best known for its demonstrations at army home-coming parades, but was there a few yards down the road, using a high-power loudspeaker in an unsuccessful attempt to drown out the speeches at the One Law event. Fortunately police had places the two groups in pens separated by a few yards on Whitehall, and the rally was able to continue with few problems. 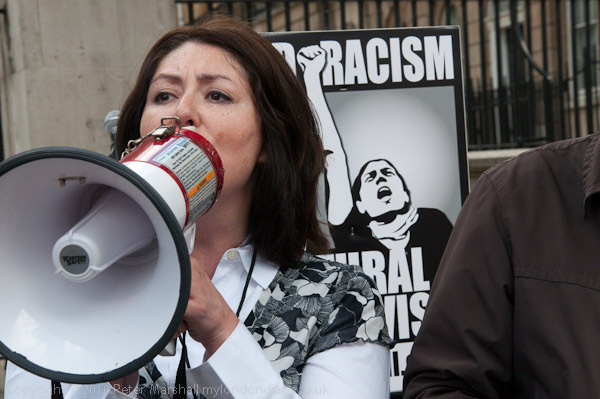 Next on the scene were around 20 or 30 members of the English Defence League, opposed to the increasing influence of Muslims on our former way of life in the UK. Some of the slogans they shouted were clearly Islamophobic, and One Law for all people clearly showed their disapproval of this. The police led them to a third pen, then searched most of the men and made sure they left the area. At this point I said to Chris Knight who was also watching the protest that it was hard to know who would appear next. But we didn’t have too long to wait to find out, as around 40 minutes later a heavily policed group of young Asian men came up Whitehall. They were looking for the EDL, and came from an East End rally against the BNP and EDL, both labelled by them as racist organisations. 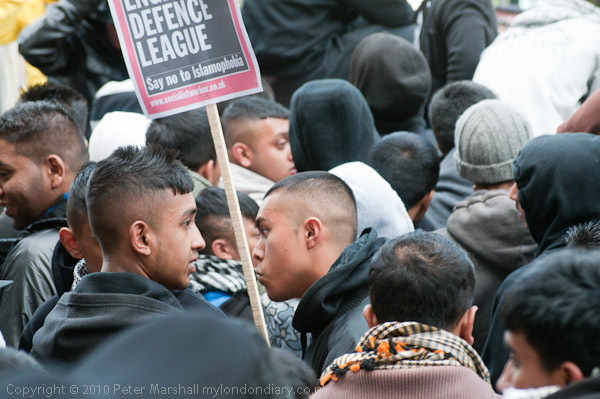 By then the EDL were long gone, and it wasn’t at all clear what these young men, mainly Muslims, felt about either the Muslim or One Law For All protests. While the police were holding this last to arrive group on the west side of Whitehall just past Downing St, the One Law For All protest started on its march to another rally at the Iranian embassy in Kensington. They had got several hundred yards ahead of me and I ran after them and took a short cut across Parliament Square (those tents were a bit in the way.) As I ran, my SB800 flash decided to part company with the D700, suggesting that it was not fixed on properly – which may well account for the flash problems I had. The combination of the Nikon 16-35mm on the D700 and the Nikon 18-105mm on the D300 (27-158mm equivalent) is a good one, the little bit of overlap between the two coming in handy, and covered virtually all my needs for these demonstrations. For some events the 105mm isn’t quite long enough, and it’s good to have the lightweight Sigma 55-200mm DC in my bag, and of course also the 10.5mm fisheye. There aren’t that many situations where the fisheye will work, but when you need it nothing else will do. I didn’t use it here, though I did take a few with the 55-200 where the police were keeping photographers apart from the young Asians. June 20 was World Refugee Day, and came at the end of a week where there had been various other events connected with refugees, although I’d not managed to photograph them though at the start of the month I had photographed a couple of events in the rather more radical European Week of Action to Stop the Deportation Machine. But the demonstration today was organised by the Refugee Week partnership, which includes groups such as the UNHCR, Red Cross, Oxfam and Amnesty International. 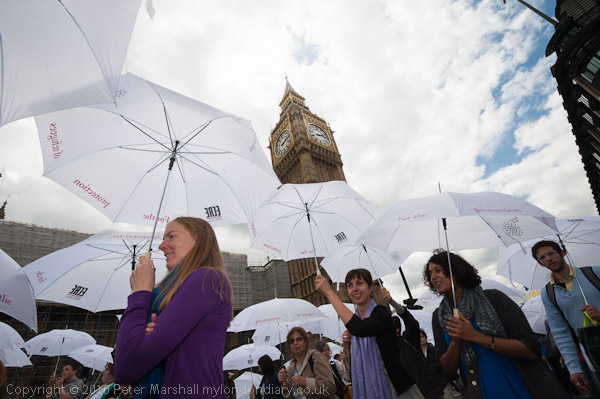 Together they had ordered large numbers of white umbrellas, rather more than the number of people who turned up for the protest, and others had brought their own decorated version, all to give the photographers something a little different to take pictures of. Unfortunately there weren’t many photographers, or at least not many pros, in evidence. Refugees aren’t news for our media unless they can manufacture some scandal or scare story about them flooding into the country in hordes, overburdening our social services, living a life of luxury thanks to our bountiful handouts. Unfortunately the truth – which is so very different – doesn’t get much of a hearing. Probably the best opportunities for pictures came at the start of the parade and later when it was passing the Houses of Parliament, where Big Ben has the advantage both of representing the government and also meaning London to almost everyone around the world. 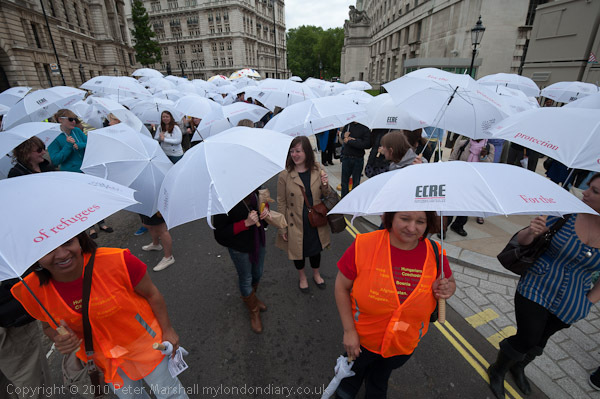 At the start I was pleased to be able to take a view showing not just the street filled with people and umbrellas, but also to capture the full text around the umbrellas in the three most prominent”ECRE For the Protection of Refugees‘. It was just a little bit of luck, although had I been organising things I might have preferred it reading better left to right across the image. But this way the word ‘refugees’ gets more prominence. Incidentally, just after I’d taken the picture the woman on the left helpfully stepped out of my way, but by then I’d taken the picture. It was a ‘Hail Mary’ shot, holding the camera with the 16-35mm as high as I could reach, at 16mm, 1/500 f11. 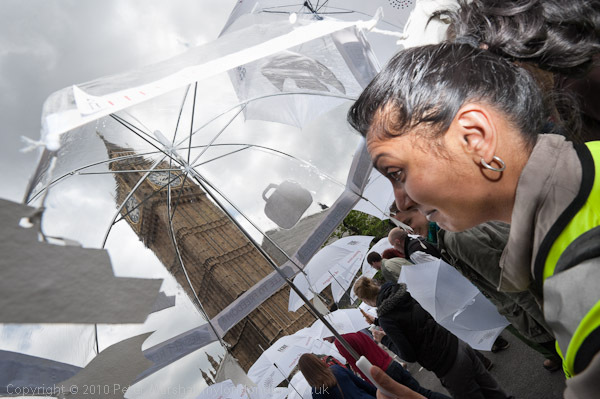 Some of the marchers had transparent umbrellas, so it seemed a good idea to shoot up through them at Big Ben. Again nothing set up, I was walking along beside this woman, very close with the 16-35 at 17mm focal length, focus on the spokes of the umbrella and at f11 most of it is pretty sharp. As I noted in my previous post, I was having problems with flash, and only the top half of this frame received any flash exposure. Fortunately I needed it on the woman’s face and most of it was in that top half. I haven’t quite got the correction this image needs perfect (I did it in a rush to get the story on Demotix on the day) but I think it works well enough. The annual chariot festival where the Hare Krishna pull their three giant chariots along Piccadilly from Hyde Park and on to Trafalgar Square first came to London in the 1980s, and I’ve photographed it several times. But it has now settled into a rather similar pattern each year and I found it hard to really find anything new this year. This year’s pictures are here. Last year was the 25th procession here, and perhaps attracted a few more people, as the numbers seemed a little smaller this year than in previous years. 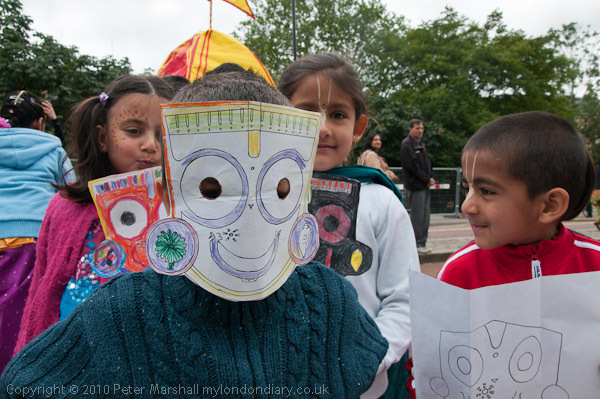 The three large chariots, each with a Hindu god or goddess, were much as before, so while I took some pictures of them I tried to concentrate more on the smaller parts of the event and on the people. As usual when the sun came out from behind the clouds I used some fill flash, and had some problems with it. The D7oo on the right settings usually works with fill at any shutter speed, though the manual is more than normally opaque about this. However with the SB800 which I was using, with custom setting e1 at 1/320s (Auto FP) when a faster shutter speed is selected in exposure mode P or A “auto FP high speed sync will be activated if the actual shutter speed is higher than 1/320“. Usually this just works, but today it had given up, and only parts of the frame got the flash exposure. Some of them can be be salvaged in processing with Lightroom’s graduated filter or local adjustment brush, but its a pain to have to do it. I’ll post an example from later in the day in another post. I probably should have noticed the uneven exposure on the camera screen while taking the pictures, but most of the time the lighting was too bright to see them properly, and I just took a quick glance at the histogram to see if everything was ok – and of course it was. When I did see the problem on the computer screen later, I wasn’t sure if it was a camera fault or a flash fault and though I knew I needed to sort it out, there were other more urgent things to do. When I finally got round to doing some tests I started with the same camera, flash and lens and found everything was working perfectly! Actually whenever I have flash problems and run tests I get the same results – its only in the field that the system sometimes misbehaves. And I think the problem is mainly the photographer, or occasionally a dirty contact. When you fit the flash working in a hurry it is too easy not to slide it fully into place, and although there is a lock, it perhaps isn’t quite as positive as it might be and I do sometimes fail to push it right across. Then looking carefully at the hot shoe it isn’t as clean as it might be, though perhaps putting the flash on again for the test may have cleaned the contacts enough to make a difference. But it appears to be good news, and I can avoid another expensive repair (the only kind there is for photo gear.) I’ve taken my glass fibre contact cleaning brush to both flash and hot-shoe to be sure there isn’t a dirt problem and added checking these to the list of occasional tasks to do to keep the gear working, and made a mental note to push the flash on firmly and check I’ve engaged the lock fully in future. 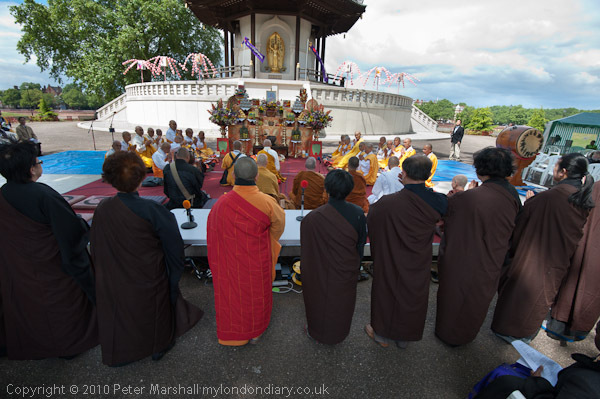 One of the more unusual structures in London, the Peace Pagoda in Battersea Park celebrated 25 years of existence earlier this month and I was there to take part in and photograph the celebrations. Over the years I’ve met monks and nuns from the nearby temple at many peace protests both in London and Aldermaston and marching between the two places. And I think you can see that the fisheye that produced the upper image wins hands down in this case. In the past I’ve often partially corrected my fisheye images using the Fisheye Hemi plugin but in this case this loses the framing by the trees in the corner, and the whole kind of circularity that organises the whole row of figures (monks and nuns from another temple) around the central altar and above that the oval gilded figure of the Buddha. The plugin does produce a better picture than the rectilinear wide angle below but in this case the uncorrected image is stronger. But the fisheye image at the top above is actually partly corrected. It is one of the rather rare lenses that Lightroom 3 has a lens profile file for. The default correction at the 100% mark is to lose the fisheye perspective completely and correct a relatively small part of the image to rectilinear. It would mean there was little point in using the fisheye, as its very wide angle of view is lost, along with its distinctive rendering. But a relatively small amount of correction moderates the obviously fisheye effect and helps this image. I think too, that cutting it down a little somehow better fits the image I had in my mind’s eye as I took the picture, despite what actually shows in the viewfinder. The two are often different. Astute viewers will also note that my images are now watermarked, and also that the jpeg is higher quality than many that I’ve posted. More about both of these shortly. But perhaps my favourite image is this one, taken with a “standard” lens, or rather a zoom which just happened to be set at a 35mm equivalent focal length of 52mm. 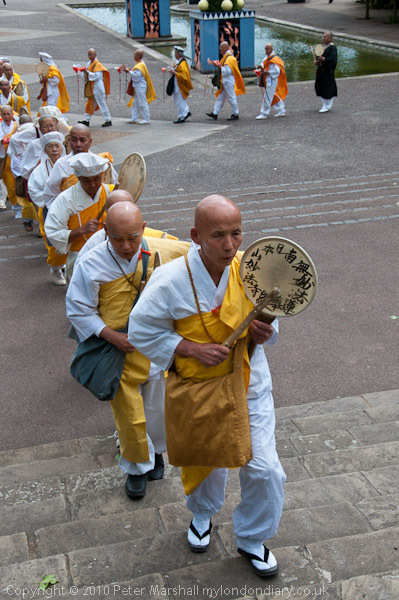 It was just luck that I arrived ten minutes before the time I’d been given for the start of the event, as the monks were forming up near their temple for the procession to the pagoda and was able to photograph a procession which I hadn’t been told was going to take place. I’m rather glad I didn’t miss it – and if possible it’s always a good idea to get to events early. 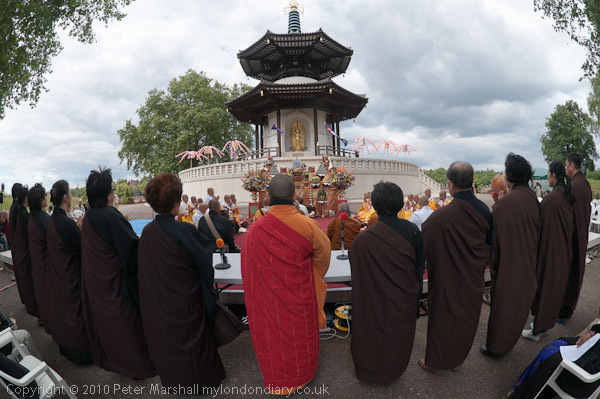 More pictures from the event – where there was a freezing wind along the Thames and it felt more like January than June – at Peace Pagoda Celebrates 25 Years. 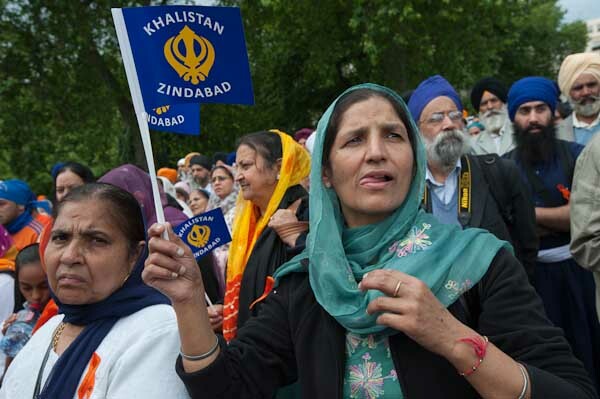 Every year, Sikhs hold a march in London around the anniversary of the 1984 massacre in India, when their most sacred temple in Amritsar was attacked by the Indian Army. 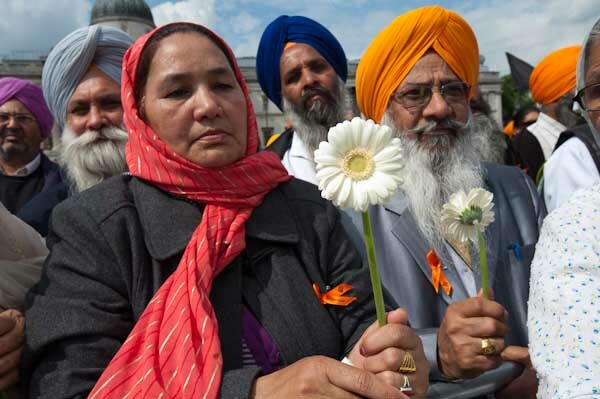 Accounts of exactly what happened and why differ, but obviously many Sikhs feel very deeply about this event and the massacres of Sikhs that came later in the year after the Indian Prime Minister had been killed by her two Sikh bodyguards. We don’t actually read a great deal about events in India in our newspapers, except at exceptional times, and there has been a great deal of violence over the years that has been unreported, particularly if it takes place away from the major cities. It’s hard for an outsider like myself to know quite how seriously to take the Sikh claims of genocide – though certainly many Sikhs have been massacred, or to know how serious is the call for an independent Sikh state of Khalistan. But certainly the march in London attracts Sikhs from around the country, and this year, the 26th anniversary, there were perhaps 5000 at the start of the march in Hyde Park and perhaps almost double that by the time the rally was taking place in Trafalgar Square. Its both a serious and a colourful march, led by baptised Sikhs in orange robes, at the front two men carrying the Sikh flags and after them the five holding their unsheathed swords up in front of them. Perhaps because of the police complaints at last year’s march there were fewer placards and almost none of the graphic images of the massacres to which the police objected, and virtually none of the obvious support for the banned armed separatist group, Babbar. 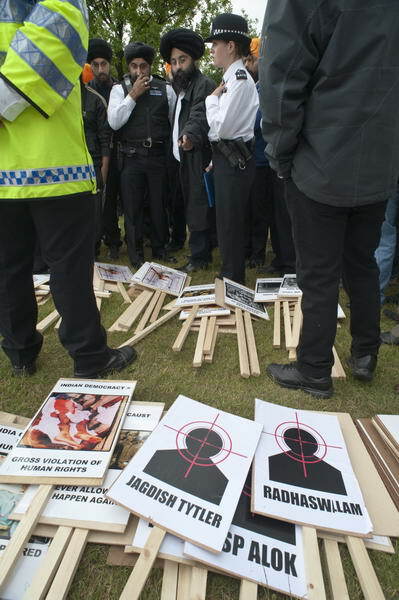 2009: Superintendent Kohli complains about some of the placards. There were just a handful of Babbar t-shirts, and most of those I saw were worn by children rather than the large groups of young men and women last year. There were many speeches, a few in English, but mainly not, although in any case I find I can’t follow speeches when my mind is engaged in making photographs. I do usually carry a small voice recorder and at times record them to listen to later, but at this event I didn’t bother. But it is a useful way to record the names of speakers and other useful information at times, often easier than finding a notebook and pen and writing them. Its perhaps too easy to treat an occasion like this as simply an opportunity to record exotic images and unusual characters in the crowd, but I try to photograph in a way that reflects the mood of the event and as far as possible the issues. Banners and placards are important as the camera doesn’t record the spoken word, and the lack of them at this event made it harder. Most of the pictures I took were of something the event organisers announced a little diffidently as something visual for the press, but it wasn’t the kind of silly publicity stunt that some PR guys like to think up. It did seem an apt way to let those at the rally take part in the event rather than just listen to speeches, by coming to lay flowers into large slabs of flower arranging foam making the shape 1984, the year of the massacre, 1984. As a small boy I used to accompany my mother as she visited the graves of long-dead relatives in half a dozen cemeteries in the area around where we lived, tidying them and putting fresh flowers on them, and all too often going along our streets we see the flowers on a fence or lamppost that mark where someone was killed. More of the pictures from this year’s march and rally on My London Diary. My upgrade copy of Lightroom 3 arrived yesterday morning – I’d ordered it on CD rather than as a download because I still like to have a box with the serial number on it. So here are my first impressions – and most of the things I mention I’ll post more about later, where helpful with some images to show the differences. Today I’m still trying to get to grips with it while cursing at not being able to get out and take pictures until after the gas engineer gets here to deal with our water heater that gave up on us just as I tried to shower this morning. It installed without problems, other than me putting in my old serial number when required to licence the product and wondering why it didn’t work. Of course I needed the new one which was on the plastic container with the CD, and once I had entered that it actually automatically created another set of boxes ready filled in the original serial number. It would have been clearer had it provided both sets of boxes to start with, and labelled one of them ‘original’ and the other ‘upgrade’. It’s the kind of little thing that suggests an inability to think like the user seeing the install program for the first time. They really need to have idiots like me to test it on! Other than that, there should perhaps be a rather more accurate warning about the time it will take to update your existing catalogue. I think it said it may take a few minutes and it actually took six hours. Yes I do have an over-large catalogue and a slightly ageing computer! So far I’m both impressed and a little depressed with LR3. The promised extra speed and stability doesn’t make itself felt on my system, if anything it sometimes feels a little more sluggish at many operations. I’ve seen the message “an unknown error occurred” perhaps a dozen times today, and it doesn’t inspire confidence. And as with previous versions I’ve found a need to keep an eye on the software slowing down, when to keep working efficiently you need to exit and reload. It doesn’t take a great deal of time but it shouldn’t be necessary, and suggests some poor memory management. A couple of times today, when I’ve been working through a filmstrip selection filtered to show only images with 2* and greater I’ve suddenly realised that LR3 has reverted to working on the full set of images, and there have been a few other similar glitches. Some of them may have been due to user error – often a problem with new software, but I’m not sure. Good news came when I tried the software on a set of images taken last Halloween, some at high ISO, and I think that every image showed at least a slight improvement thanks to the new processing engine, and certainly because of the improved noise reduction. Still perhaps not up to the best of external NR software – such as Noise Ninja, but I think the gap is small. If you are interested in seeing pictures rather than examining them microscopically I think you will find it good enough. The other really big feature LR3 promised for me was the automatic treatment of distortion, chromatic aberration and vignetting. I’ll write more about that with some examples in a later post. It works pretty well and seems very flexible, and if a lens preset doesn’t do the job you can still do more things manually than you could before. But the real problem is that at the moment few of the lenses I use are covered by the software. Sigma apparently collaborated with Adobe and profiles are provided for over 50 of their lenses, but unfortunately not the one I most often use. Neither Nikon or Canon appear to have given any help to Adobe, and there are only a little over a dozen Nikon lenses and roughly twice that number of Canon lenses included, along with one or two from other manufacturers. I think only two of the lenses currently in my active kit have profiles supplied, the Sigma 24-70 f2.8 and the Nikon 10.5mm fisheye. It also has a profile for a Sigma 10-20 f4-5.6 DC HSM EX lens, but for some reason doesn’t automatically apply this – perhaps my lens is a different version, although it does seem to more or less work. Adobe do supply a free download with targets to photograph and software to produce profiles for any lens, and when I’ve some spare days I’ll give it a try – but it looks like a fairly long job – with 72 sets of 9 carefully made images needed for a complete lens calibration of a wide-angle zoom. They encourage people to upload the profiles they’ve made and say they intend to make them available. But not so far for LR3 users. There may actually be profiles available on the Adobe web site, but unless you have a copy of the latest version of Photoshop you cannot access them. I suppose I could install a trial copy to check for them and download if present, or find someone who has a copy and ask them to look for me, but I really think I should not have to do so. Apparently they ran out of time to incorporate the button which would connect and download these additional profiles into LR3 – and so perhaps it will arrive in LR3.1 or soon after, but in the meantime they could avoid an awful lot of illwill from the buyers (or prospective buyers) of Lightroom simply by making them available for manual download. It would only take a minute or two of someone at Adobe’s time to make a zip file available of the whole set and update it every month or so. But I frankly think we deserve rather better from Adobe. A make your own profile approach is acceptable for almost free software – such as PTLens – we deserve rather more given the cost of Lightroom, and we should be at least provided with profiles for the full current range of lenses from the major manufacturers. Neither the 18-105mm DX Nikkor nor the 16-35mm FX lens have a profile provided as yet. This isn’t by any means a perfect release, and parts of the file export system have never worked too well. I export jpegs for my web site at 600×600 pixels, and although it’s convenient to do this from Lightroom, I’ve always been able to get both smaller files and higher quality by starting with full size output files from LR and batch processing them down to 600×600 in other software – including an old copy of ACDSee Pro which I mainly use as a file viewer. Things may even have deteriorated in LR3. One of the files in the batch I tried it out on came out at 455KB, and several others were between 150 and 200KB. Back in the old days when we all connected dial-up I used to think 60KB was a large web file. Nowadays it isn’t quite so important, but 455KB is still over the top. So I noticed that instead of specifying a percentage for size in the output dialogue you could chose a maximum size. I selected just the one image with the big output file and set the maximum size to 200KB and clicked. This time it came out as 565KB! Fortunately there is a work around and I’ll have to get used to it – simply by outputting the files via the web module to a temporary web directory, then finding the image files and copying them to the folder in my web site and deleting the rest of the generated junk. That way the problem image came down to just 102KB and actually looks better – and it was no longer the largest file in the set. It looks to me as if files that needed a lot of local adjustment are not being properly handled in the export module. It’s a bit of a paing to have to do the extra steps. LR3 does however enable you to very easily set up watermark presets, and I’ve decided from now on to include a relatively unobtrusive copyright message at the bottom left of each picture I put on the web. More about this in another post. I think for most people the answer is clearly yes, it’s already worthwhile, and like previous Lightroom versions many of the annoyances will in time be removed by free fractional updates. Some which were present in previous versions will probably continue. It’s perhaps surprising given the long time LR3 was in public beta that there still seems to be quite a lot to do. But most of the problems are relatively minor, and overall it’s a very impressive program that does everything you need for almost all of your digital images from the point of exposure to the final output with a minimum of fuss and very little duplication of effort or files. Unless you have peculiar needs (and perhaps if speed is the only consideration and you don’t need the features this software offers) then Lightroom will simplify your work and get you better organised. Like all such Swiss Army knives, other software can do some of the individual tasks it performs slightly better, but mostly the differences are pretty marginal. I’ll still use Photoshop occasionally (though mostly when working with scans rather than digital files) and some other software, but rely on Lightroom for the bulk of my work with images. Some more detailed posts about LR3, with some image examples will I hope follow when I have time. The central part of Whitehall close to Downing Street was already fairly crowded when I arrived, and the rally which I had been told would start at 1.30pm was already in full swing a quarter of an hour earlier. It’s always a bit of a problem to know when to turn up for demonstrations; often I arrive early and hang around for ages until the protesters turn up, and occasionally I’ve given up and gone away before things have actually started. Also probably around one in ten of the events I find or am sent information about never actually take place at all or at a different time or place than the information I’m given. But this one was certainly going to happen, and if it wasn’t quite on the massive scale the seven or so groups organising it had hoped, there were probably close to 20,000 by the end. One of the vital skills you need to learn to cover demonstrations is how to get to the right place at the right time. Often, as in this case, it means pushing your way through tightly packed crowds. You need to to have a certain amount of confidence in your right to do so and to keep saying “Excuse me” to people as you push past. Usually it works and I was soon in a good position to photograph the speakers at the rally. There was a small area around the microphones surrounded by barriers which I probably could have gained entrance to with my press card, but it was really too small, and there were too many people – mainly stewards – in it already. The main group organising the event were ‘Stop The War‘ and I’ve found them to be one of the most photographer unfriendly organisations in the universe, and today was no exception. On previous occasions I’ve been deliberately assaulted by their stewards, and on other occasions narrowly escaped serious injury as they pushed me roughly backwards. 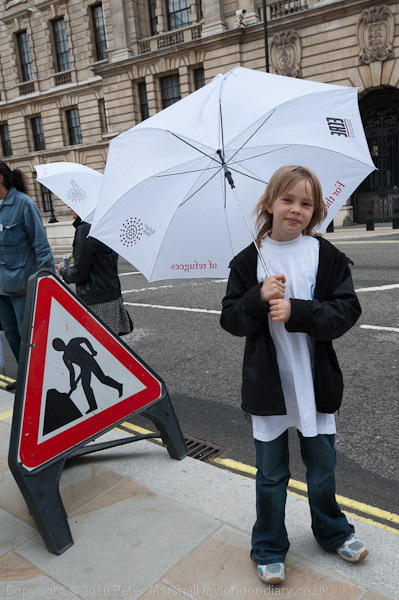 On one memorable occasion, the photographers present were so outraged at the treatment we were getting that we actually sat down on Park Lane and halted the demonstration until we were allowed to take some photographs. So I kept outside the pen to get a decent working distance and avoid the stewards, just in case. Unfortunately both here and at the rally at the end of the march opposite the Israeli embassy in Kensington – where I again kept outside the barriers – there were too many stewards in the way, along with a few people with camcorders (rather than professional video equipment) who I imagine were working for free for one of the seven organising bodies but also rather blocked the view for those of us outside. Had I been working inside, I would have had the courtesy to keep my head down, certainly when I was not actually taking pictures, and stewards should simply be kept out of the way. To photograph people speaking I like to be far enough away not have to point my camera up at them at a steep angle, and preferably to be able to get a tightly framed head shot with a focal length of perhaps 100-150mm. Stop the War stewards keep the press at a distance. Why? Before the start of the march, when people are lining up, it’s good to be able to approach the front of the march fairly closely to take some pictures, preferably without any stewards to get in the way. That way you can usually get some good images of those who are leading the march. But at Stop The War organised events such as this, photographers are generally kept quite a distance away, and on this occasion I found myself shooting with a 200mm from around 20 metres when I would prefer to be working with a 28mm or even shorter. Its perhaps less of a problem for some of the other photographers who carry huge lenses (something of a status symbol, particularly for Canon users who favour lenses elephantine in size and an off-white colour, and which I think really should be provided with a bearer.) But I only use a really long lens when I have to – like the Summer when I got Arts Council money to photograph women’s cricket – nice people but as well as the pictures here I also photographed the games. So my 200mm is a slow 55-200mm, all of 340 g and 4 inches long with the hood reversed. It’s a Sigma DC lens, f4-5.6 and no longer made, but noticeably sharper than the Nikon 18-200 zoom (which I managed to write off a couple of weeks back in any case.) Although only designed to cover the smaller DX format, by removing a few mm from the nicely effective lens hood, it also gives pretty acceptable results on full frame FX from around 70mm up (more here.) Compared to the elephant trunk lenses it looks a toy, but it delivers pretty well. 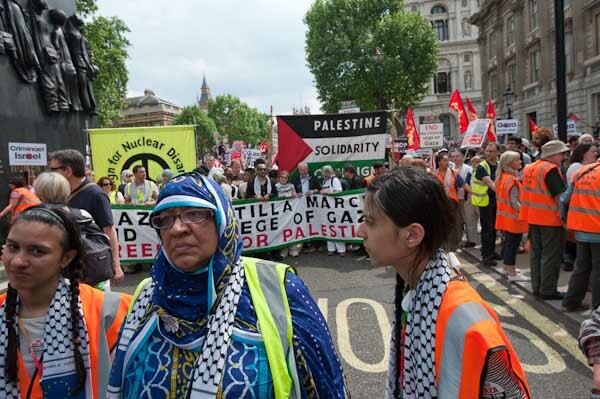 More pictures in Gaza Flotilla Atrocity Protest on My London Diary. Here’s a post I wrote a year ago, but never actually completed! The pictures were taken on Sun 28 June 2009. One or two of the pictures here and from the chariot festival earlier in the day don’t quite have enough depth of field for my taste; having just got a new Sigma f2.8 24-70mm I wanted to see what I could do with it, particularly wide open. 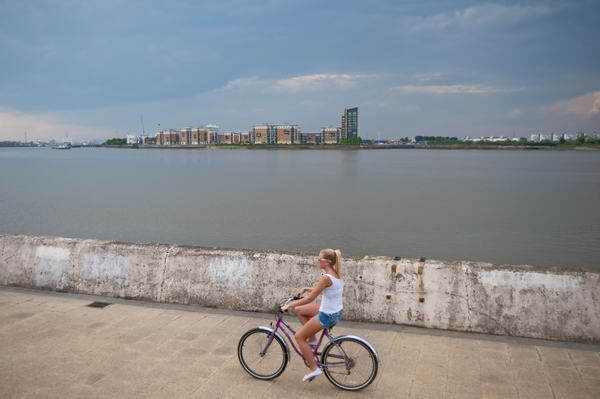 The shot above was taken at f2.8, and although the cyclist and the wall are sharp, the buildings on the other side of the river are a little soft. In this case it may help the picture, but generally I think I prefer things sharp. The lens does pretty well wide open, but stopping down to f4 or more does just add a little edge on sharpness and also reduces the vignetting you can see in the images above and below, both or which are uncorrected. Of course it’s a simple job to correct this in Lightroom. I was also working with a Sigma 55-200mm f4-5.6 DC lens, one of the lightest lenses I own at around 350g, which I’ve had for several years. I’ve never thoroughly tested this on the D200 and D300 I’ve used it on, but certainly the results seem at least one tad sharper than those from the Nikon 18-210mm, perhaps hardly surprising given its much smaller zoom range. I tried this lens on the D700, but as it is a DC lens, designed for the smaller FX format I expected to have to switch the D700 to FX format. To my surprise it seems to give pretty good results on the large FX format too, especially at the longer end. It has now been replaced by the slightly heavier 50-200mm f/4-5.6 DC which I’ve not tried and may or may not have a similar coverage. I’ve used various Sigma lenses over the years, and particularly those in the EX range seem generally to be excellent performers and most of them have proved pretty robust. The Sigma 12-24mm EX (now replaced by a similar but improved model) is certainly good on the DX format, and the results are ok on FX, except that the 12mm end does really go too far on full-frame 35mm. 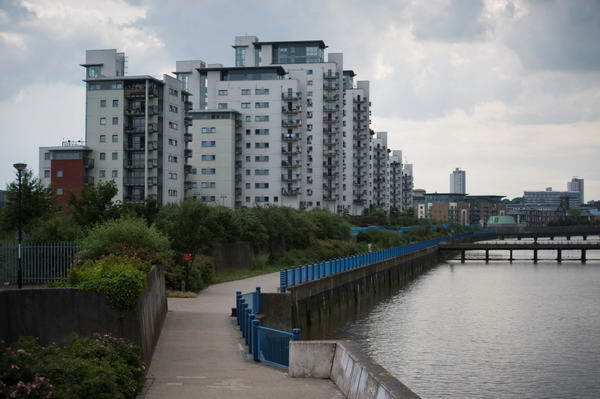 The occasions where a rectilinear lens with a focal length of less than 16mm really works are few and far between – not a criticism of the lens but it is just a little too extreme. It’s also a lens with an exposed very curved front element, impossible to use a filter for protection. Mine lasted for around 3 years before it began to have too many little defects to be really usable – giving vaguely soft areas or excessive flare whenever it was used against the light. The good news is that is wasn’t hugely expensive to have the front element replaced with a new one – I think about a fifth of the cost of a new lens, but the slightly bad news was that it took around a couple of months for the new part to arrive here to be fitted. I’ve written before about the problems that developed with the Sigma 24-70mm. Eventually I got a replacement lens from Japan and everything seemed ok for a couple of weeks. Then I was taking pictures on a family visit to Richmond Park and the lens jammed again, refusing to zoom past around 30mm. Cursing I packed it up and sent it back to Sigma, getting a phone call a couple of days later asking what the problem was because it seemed to be working perfectly. I think the shaking in the post must have managed to free whatever was jamming it. I told them what it had done and they promised to check it out before sending it back, and I hope the problem is now solved, but although it seems to be working perfectly I’m still keeping my fingers crossed every time I take it out. One piece of good news is that this is one of the lenses that has a profile that comes with LR3, correcting the distortion (noticeable on some shots at the 24mm end), most of the chromatic aberration (which is pretty typical for a lens of this type) and the vignetting. So there are good reasons to use this lens now. Would I buy Sigma again? Yes, despite the problems with this one lens. I’ve owned half a dozen or more others that have been good, and either had unique characteristics that appealed to me, or have offered a fairly substantial saving over the Nikon equivalents. And I think all of them have had better lens hoods – I get really fed up with the rather flimsy Nikon lens hoods which seem to fall off at a fairly light touch – they are just not made of a stiff enough plastic. You are currently browsing the Re-photo blog archives for June, 2010.